The summer of 2007, North Carolina and certainly Chatham County, experienced a severe drought. Even though we are conservationist minded and consider ourselves to be careful about not wasting water, we decided to analyze exactly where it was used and how we could conserve even more. 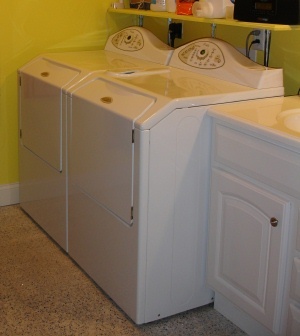 We have the Energy Star® Maytag Neptune front-loader washing machine. It uses less water and electricity and is able to handle a larger load at a time than most standard washing machines and certainly all top loaders. We use the "max extract" feature to remove as much excess water as possible so the clothes dry quickly on our clothes rack or outdoor line (as you see, we have a dryer but use it only for fluffing or in last minute urgent dry situations. With the max extract feature, it cuts the drying time to approx 15 minutes for a standard load - the old dryer took over an hour). However, did you know the washing machine extra rinse cycle uses 15 gallons of water just by itself? This was quite a shock. We've eliminated using that cycle and now add less detergent and a cup of baking soda - the latter helps get clothes cleaner and adds a natural fabric softener too. We also use cleaning, laundry and personal care products in our home with NO bleach, NO ammonia, NO Formaldehyde, NO Parabens, NO abrasives, NO triclosan, NO phthalates, NO phosphates. The power of laundry detergent using natural surfactants to remove the dirt. Protects our clothes, our skin and the environment. 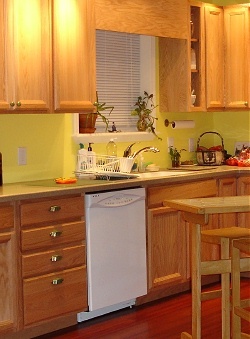 The dishwasher was next, which is also an Energy Star® appliance. The light load feature only uses 6 gallons of water. You can't wash a full load in the sink with that amount of water. We have a dual shower head, of which one is a hand-held with a switch to turn off after soaping up - like a military shower. 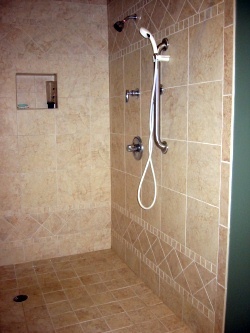 This took our shower water use from 15 gallons down to 5 gallons - even for a woman when I wash my shoulder length hair! We have low flush toilets - they say "1.5 gallons" but in fact use 1.75 gallons per flush, even though it has been properly filled to manufactures water mark. Using less than that mark, it often takes 2 flushes. We adhere to the yellow-mellow rule for daily flushing. So overall we have reduced our monthly water use from 3,800 gallons to under 2,900. These are consistent numbers, based on almost 2 years of monitoring. We have overnight guests for several nights a month and large dinner parties at least bi-weekly. Our goal for this year is to add a big cistern (approx 5,000 gallons+) which will be used for all the garden/landscape watering and flushing the toilets. After a year we can then report the water use difference that will make.